A lot of lab tutorials assume you have access to powerful systems with 32 or 64GB of RAM, RAID arrays, dual CPU server systems and so on. This one’s different. I’m taking a couple relatively modern workstations with 16GB or less RAM each and creating a Windows Active Directory domain environment. The cool thing here is with an extra switch we can add multiple physical systems into our virtual lab. *workstation 1 requires 2 network cards. At the time of writing Windows Server 2012–2019 are currently available. 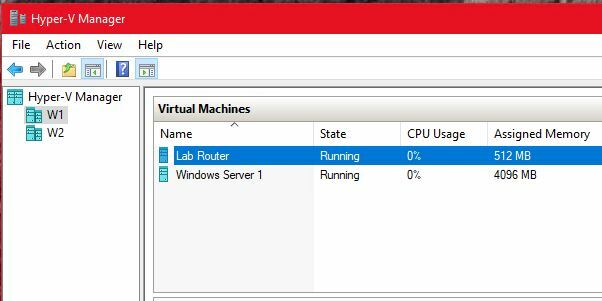 This lab will use Windows Server 2016. Download these ISOs and place then in an easily accessible location for later use. Connect both NICs in W1. Connect NIC in W2 to switch**, if not directly connected to W1. **Most modern NICs no longer need a crossover cable to directly connect. If you’re having issues with a connection, a switch should resolve this, or a cross-over cable. Under Name, enter External Access, and assign the NIC connected in step 1 above to your regular network environment, and click OK.
Click select External, Create Virtual Switch again. 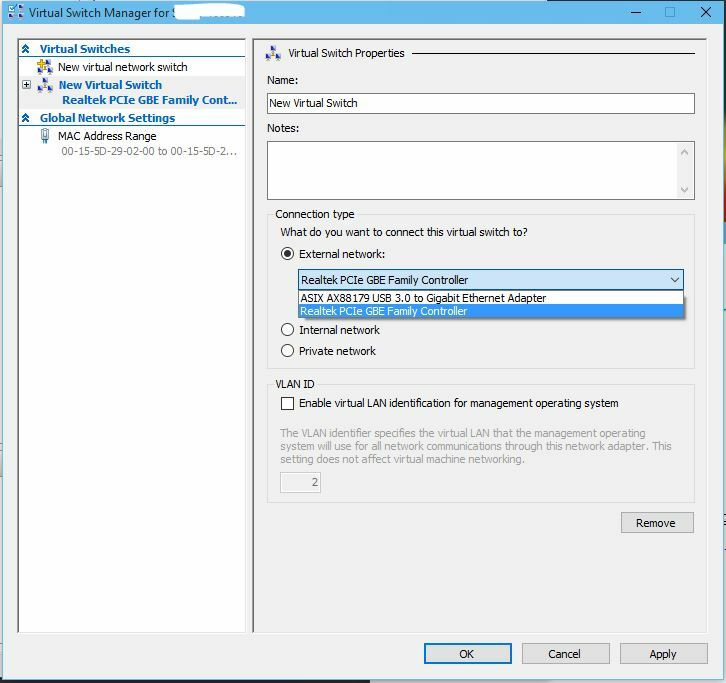 Under Name, enter Internal Lab, select the second NIC and click OK.
Click OK to exit the Virtual Switch Manager. Set IP Address for second NIC. Right-click on vEthernet (Internal Lab) and select Properties. Select Internet Protocol Version 4 (TCP/IPv4), then click Properties. Return to the Hyper-V Manager and click New –> Virtual Machine. Click Next to begin the wizard, enter the info in the fields and click Next when finished. Select Lab Router from Virtual Machines and click Settings. Select DVD Drive, then select Image file. Click Browse and go to the location where the IPFire ISO is stored. Double-click the ISO. Click OK.
Start the Lab Router VM. Press Enter to begin the installation. Note: Window title will appear before instructions for this section. License Agreement: Press tab to move to license acceptance box, then press the spacebar to accept. Press tab and Enter to complete. Filesystem Selection: Press tab and Enter to accept the default. While IPFire is rebooting, we need to determine which NIC’s MAC address is the External Lab’s. 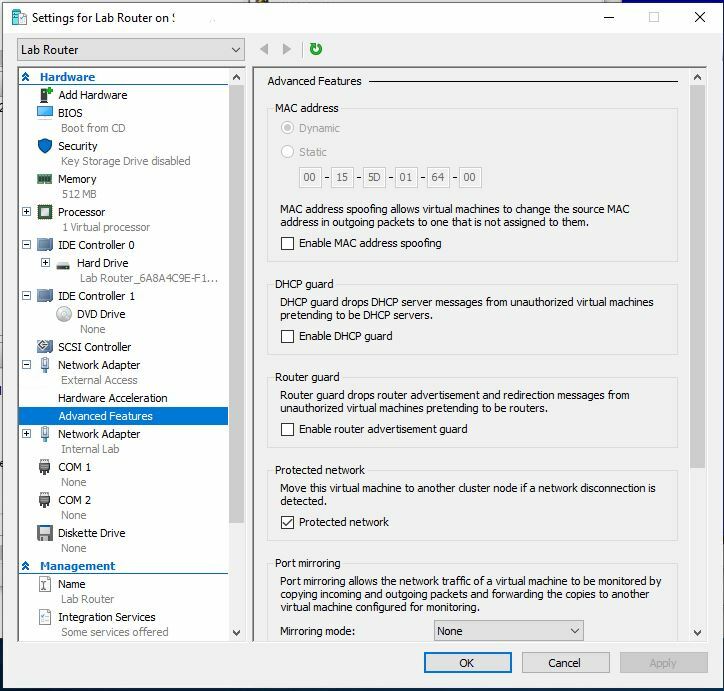 In the Hyper-V Manager with Lab Router selected, click Settings. Click on plus (+) next to Network Adapter External Access, then click Advanced Features to view the adapters MAC. Leave this window open, or make note of the MAC as we will need it soon. Keyboard Mapping: Press Enter to select the default mapping. Timezone: Choose the correct timezone and press enter. Hint: pressing a letter will jump to that section. US Pacific (press P and arrow to PST8PDT) can be found this way quickly. Hostname: Press Enter twice to accept the default, ipfire. Domain name: Press Enter twice to accept the default. Root password: Enter a memorable password, tab to the verification field, and tab again to OK. Press Enter. Hint: no characters will appear when entering the password. Admin password: Enter a memorable password, tab to the verification field, and tab again to OK. Press Enter. Hint: no characters will appear when entering the password. Extra hint: for our lab, this can be the same password as the root account for simplicity. Network configuration: network configuration type: GREEN + RED should already be selected. Assigned cards: GREEN: Press Enter to select. Hint: the GREEN network is our Internal Lab network. Press Enter to select the remaining card. Address settings: RED: Press Enter to reconfigure. Address settings: Press tab to move to Done, press Enter. Arrow key down to Done and press Enter. Hint: we do not need to set the DNS and Gateway settings, the DHCP option selected above in 9-2 will autopopulate this for the RED network. DHCP server configuration: We will use the DHCP and DNS services on our Windows Server VM that we will set up later. Tab to OK and press Enter to leave the IPFire DHCP server unconfigured. Setup is complete: Press Enter. IPFire will reboot. IPFire/Lab Router VM should remain running. Close the Lab Router settings window, if needed. Select Windows Server 1 from Virtual Machines and click Settings. Click Start, and then Connect. Select Windows Server 2016 Datacenter Evaluation (Desktop Experience) and click Next. 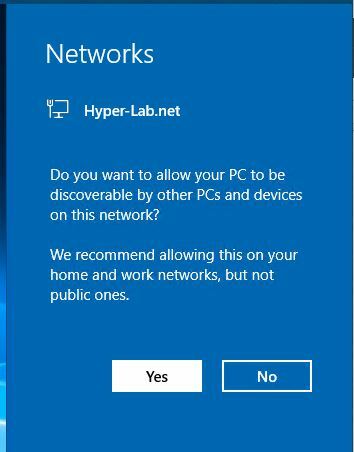 Networks: when prompted, click Yes to allow your PC to be discoverable. In Control Panel, go to System. Under Computer name, click Change Settings. Follow the wizard’s steps. All the defaults can be used for our lab purposes. Promote: Add a new forest. Enter the domain name, Hyper-LAB.net, and follow the wizard. Hint: you will get a warning about DNS, this will be resolved later. Log into your new domain controller. Right-click on your server and click Properties. Click Edit, and add your external DNS servers like 4.2.2.1, 4.2.2.2, 8.8.8.8, and 8.8.4.4. Click OK, when completed. Click OK, to close Properties. Expand IPv4 and right-click, click New Scope from the menu. The remaining settings can be default for now. When asked to configure scope options, select “Yes” and click Next. Router/Default gateway will be the IP we used to configure the GREEN NIC, enter: 172.16.1.1. Click Add. Click Next. Domain name and DNS should be pre-configured. You should see the server’s IP in IP address box, 172.16.1.201. Click Next. WINS does not need to be configured at this time. Click Next. When prompted to activate scope, select “Yes” and click Next. Ping will not work until we disable the firewall, or turn on file and print sharing for the Private network. Under Name, enter Internal Lab, and assign the NIC and click OK. When you try to connect with Hyper-V Manager you’ll receive an error from Hyper-V Manager that it’s either not running or you are not authorized. Run quickconfig: winrm quickconfig Enter “y” to make the changes. Select Enabled. Click Show, enter wsman/W2. Click OK twice. Select Another Computer, enter W2. 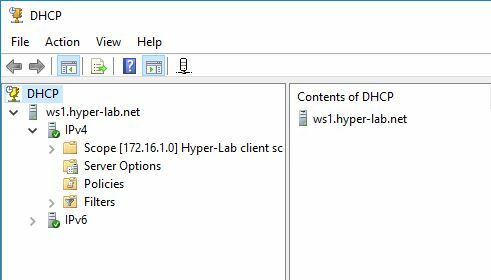 You can add more Hyper-V “servers” to your network with a switch for the Internal Lab network between W1, W2, and the other servers, follow the steps for W2 with each new Hyper-V server. Keep in mind that you can just use low-end workstations for clients in this scenario also. They just need to be added to the Internal Lab network’s switch.